The block bustard film of year 2006, Majajan a Punjabi film directed by Syed Noor was released across theaters in Pakistan in March 24, 2006. It did very well at the box office as it did Solo Silver Jubilees on its two main cinemas Metropole and Sozo Gold in Lahore. In a interview, director Syed Noor said that once he read the verses of Baba Bulleh Shah he promised himself that he will make a film on the concept of Ishq of great Sufi poet. He was looking for an opportunity to do that so he discussed the story with my wife (Rukhsana Noor) who is also a writer. She converted it into a full-fledged script and finally and created Majajan. On the other hand the producer of film Saima didn’t compromise on quality, and spent lavishly on making Majajan a masterpiece. Majajan‘s soundtrack consists of 10 songs of which only half have been used. Shaan has played this kind of role for the first time. Majajan is a love story Syed Noor says he made it most passionately. As said earlier, it was inspired by the life of Baba Bulleh Shah and his ‘ishq‘ with his ‘murshad’, It is interesting that Director of Majajan Syed Noor married the heroine Saima during shooting of this film. 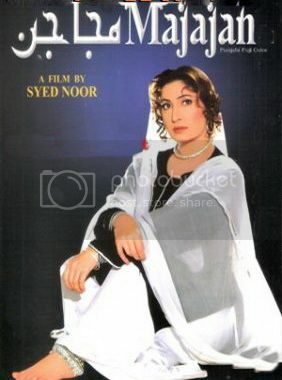 Majajan and has crossed Diamond Jubilee (100 weeks) in Lahore’s cinemas. The story of film revolves around three perons, Zil-e-Shah (Shaan) an unhappily married man who belongs to the Syed clan, who falls in love with a courtesan, by the name of Taari (Saima) who arrives to perform in his village. Shaan’s wife (Madiha Shah) and family condemn their relationship due to difference in their clan/cast.